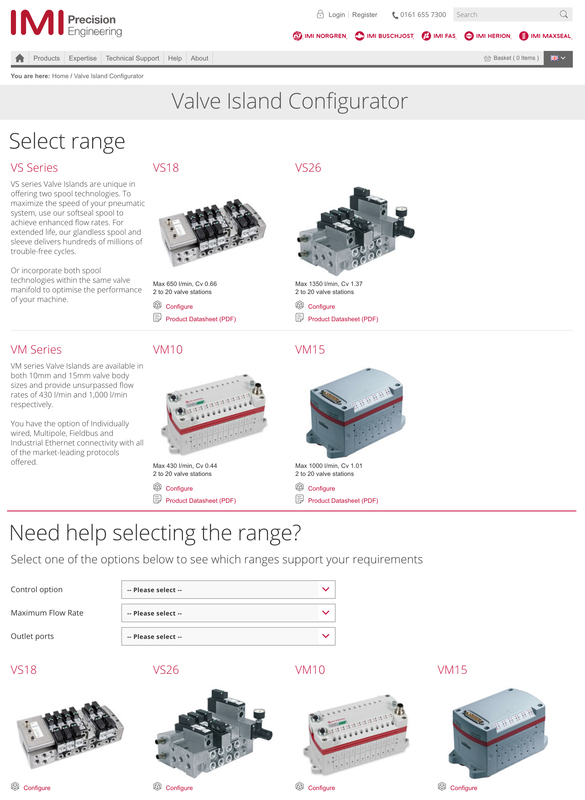 IMI Precision Engineering, world-leader in fluid and motion control, introduces IMI Norgren’s brand new Valve Island Configurator, designed to help create your unique product, making product selection simple and straightforward. It is possible to choose each part of the component and then specify the exact configuration required using simple selection lists. The configurator enables quick specification of the valve island to exactly meet each and every requirements and allows live visualisation of your configuration thanks to downloadable 2D and 3D cad files. It is possible to download the chosen configuration in the customer’s native CAD format, since the IMI Norgren Valves Islands Configurator supports 60+ native CAD formats including AutoCAD, SolidWorks, Pro/Engineer, NX and Catia. The configurator also provides price, availability and order now options thanks to a unique part number assigned to your manifold; clients can save their configurations for a later date and view their history anytime. Equally important is the ability to access and download all technical documentation, available in multiple languages. Online and telephone support is available. The IMI Norgren VM Series Valve islands are available in both 10 mm and 15 mm valve body widths and provide unsurpassed flow rates of 430 l/min and 1,000 l/min respectively. Full option of Individually wired, Multipole, Fieldbus(*) and Industrial Ethernet(*) connectivity with all of the market-leading protocols offered. You can also choose from DIN rail, through hole, panel and sub base mounting options. Valve islands can be configured from 2 to 20 stations (Individually Wired option above 16 stations only) with single or double solenoids and with a high number of possibilities for manual overrides and tube fitting sizes. This results in over 15 million possible configurations. VS series Valve Islands are unique in offering two spool technologies. To maximize the speed of your pneumatic system, use our softseal spool to achieve enhanced flow rates. For extended life, our glandless spool and sleeve delivers hundreds of millions of trouble-free cycles, or incorporate both spool technologies within the same valve manifold to optimise the performance of your machine. The IMI Norgren VS Series gives you the versatility to choose the features you need with the modularity to easily expand and add accessories. By combining flexibility and Swiss-engineered quality, IMI Norgren has created a no-compromise valve range with unlimited ability.